Seacoast United Goalkeeper School (SUGS) Premier Residential Soccer Camp at Brewster Academy is designed to guide soccer goalkeepers through all the major techniques and components of the position, instilling the skills, knowledge, and confidence to perform optimally at their desired level of play. This camp takes place at Brewster's beautiful campus on Lake Winnipesaukee in Wolfeboro, NH. The SUGS philosophy revolves around developing the keepers both mentally and physically. The instruction and activities are designed to challenge all keepers both in terms of technique and decision making ability. 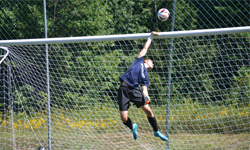 As always, along with learning, we strive to ensure a fun environment and will provide a variety of activities that will help players develop a sound keeper mentality, refine techniques and even enjoy improving critical goalkeeper specific fitness levels. The SUGS program has produced more than 70 collegiate goalkeepers to date, including 20 at the NCAA Division I level including such prestigious programs as Duke, Virginia, Stanford, Boston College, and Northeastern University. The coaching staff is first class and has many years' experience producing the highest level goalkeepers and this week is designed to take improve your play and knowledge of this most important of positions. The morning conditioning fitness element will be followed with the technical topics of the day. Typical topics covered will include: Catching technique, tipping and deflecting, lateral/forward/backward footwork movement, handling crosses, punching, breakaway saves, dealing with back passes, and more. Topics will also be covered in a realistic game-type setting. Afternoon sessions will specifically deal with in-game management techniques in small-sided games. Topics covered include controlling/instructing your defense, set plays (corner kicks, free kicks), restarts and wall building, penalty kicks, keeper positioning in relation to the ball in play. During evening sessions players will participate in camp games and will be placed appropriately according to age and ability level. The keeper coaching staff will be continually monitoring and mentoring the keepers individually throughout the games. REGISTRATION: Register online for the 2019 SUGS Premier Residential Camp by clicking here. Questions? Please contact Andrew Pesce at apesci@seacoastunited.com.